The (very!) 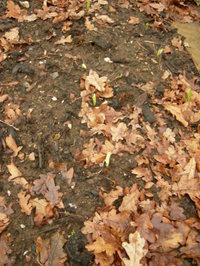 early gutter sown peas have come up already (two weeks after sowing) and amongst the fallen leaves the first of the broad beans, Aquadulce Claudia, have broken the surface (three and a half weeks after sowing). Not much leggy growth so fingers crossed they'll make it through the frosts forecast for this week. I'm a little worried that I've not seen any garlic yet but there is time. Now that I have a greenhouse I'm thinking of starting off some winter salads - corn salad, lambs lettuce/claytonia/Vit, that type of thing. 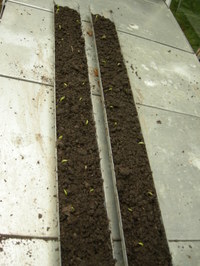 I'll sow them in trays indoors, harden them off in the lean too and then put them out in the unheated greenhouse. Any advice? Is a potting compost/seedling mix a suitable growing medium? Right now the greenhouse has gravel over landscape fabric on one side and sand over landscape fabric on the other. So the new gardening season is under way! The wintry weekend mornings were just perfect for a side of boxty to go with the poached eggs and baked beans. I quickly realised though that the boxty recipe needs fine tuning (eggs to bind rather than more flour). The cakes, reheated from frozen in the microwave were very doughy - a bit like eating a warmed up brown bap. They'd lost their crispy crust as well but how I'm going to solve that I'm not sure. Finish them off under the grill or in the toaster perhaps? Boxty in the griddle, Boxty in the pan, If you can't make boxty you'll never keep a man. 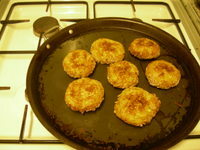 So it had to be boxty to go with supper - basically baked potato cakes. The recipe I had called for 2lbs of grated potatoes, a generous handful of flour, salt and pepper to taste. 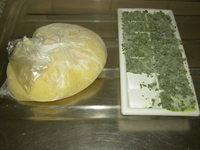 This is mixed and pressed into rounds and baked in the oven on an oiled pizza tray, 200C for 45-50 minutes until golden. Next time I'll add chive and parsley to the mix and squeeze more water out of the potatoes to see if they bind using less flour (I've seen recipes calling for a 50/50 mix of grated potatoes and mashed potatoes). They were good though, a nice crunchy crust giving way to a soft centre. I'll try them cold with a yoghurt dip to see if they make good picnic food and over the weekend I'll reheat them topped with a fried egg. I've also frozen some to see how early potatoes cooked in this way store when they would otherwise be starting to soften and go off around now. In February I posted about the grelos seeds I got in Santiago de Compostela. 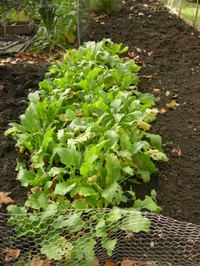 Well this is the grelos crop I've got from an August sowing and it has grown a lot more than I expected. It's a bit untidy looking and lacks the impact of other winter vegetables like sprouts and the blistered leaves of black tuscan kale have. But I didn't have to thin or transplant it so it was easy to grow. I delayed a second sowing until mid September and that crop is a quarter of the size so I expect it will provide spring greens next February/March when there is not a lot else growing. Wilted with some garlic, red onion and red wine vinegar the early sowing was tart and fibrous despite removing the ribs. Next time I'll add a sprinkling of brown sugar to the pan. I may also try it with mash and make bubble and squeak and I bet it's just right for caldo gallego soup. I sense though that it may be a 'duty eat' just because it's there and it would be a shame to waste it. "Eating locally in winter is easy. But the time to think about that would be in August." writes Barbara Kingsolver in Animal, Vegetable, Miracle. Well even though we are only getting to the end of November, I'm already dipping into to what's stored in the freezer. Mashed potato on the left, frozen flat in portion size so it stacks easily and parsley pesto cubes (I usually pop these out of the tray once frozen and keep them in a freezer bag). I've also got some coriander and rocket pesto frozen in cubes as well. Checking on the Charlotte potatoes in the cellar, I notice some are getting a bit soft, so I think it's going to be a marathon mashing and freezing session later this evening. Meantime if this snotty weather we are having would only let up maybe I could get out, tidy up the veg plot and harvest some Brussels. I'd intended waiting until the New Year to taste the Golden Wonder potatoes - they improve with storage so I've read - but my wife perpared a helping last night. They are so different to my waxy favourite, Charlotte. Loads of starch and very floury, they crisp up really well when roasted and there's a nice contrast between the crust and the floury inside. I can imagine that they fry well, soaking up a nice bit of fat in the process. This helping was cooked peeled, next time I'll leave the skin on to see if it makes any difference. I was won over by their deep earthy taste, quite sweet almost, and I'll sow at least one row of these next year. Let's see how they improve in store. I do like gardening but it's growing to eat that I love. So I'm often casting about the blogosphere looking for good recipes and bloggers who are interested in their food. Check out Joanna's Food and read about how the shock of a heart attack jolted her into new eating habits. No 'woe is me' here just a desire to eat healthily and enjoyably. For the past few seasons I've grown Blauhide, a prolific, stringless, climbing, purple podded bean. But it's a bit disappointing when it turns a meaty green when cooked though the taste is good. I'm looking for varieties that keep their colour so I can have a tricolour salad of beans - deep purple, green and yellow. Sunday was the perfect chutney making day - overcast, a tad chilly and raining heavily - a hint that there's a change of season on the way. While I'd planned a chutney making marathon with a glut of courgettes and tomatoes to hand things didn't go as I'd hoped. So instead we knocked up eight pints of summer pudding mix - Autumn Bliss raspberries, wild blackberries from the allotment and apples. It's been a good year for soft fruit. We followed this with eight pints of courgette and basil soup. The house was beginning to smell like a cross between a sweet factory and a pie shop. 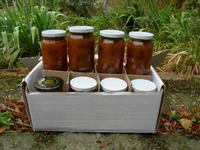 And we rounded off the day with a modest 12 pounds of courgette and tomato chutney - looking nice and dark this year. Even if you follow faithfully a recipe from year to year the results always differ slightly. Now we just have to wait two months or so to see how the flavours develop and if we can declare August 06 a vintage year. Somehow I think it's pretty hard to go wrong with the sweet and sour mix of sugar and vinegar. But I've a question: how long before last year's chutney spoils or does it have the afterlife of a nuclear fuel rod? When I saw the scale of Dirt Sun Rain canning and preserving operation it put my piddling efforts at freezing rhubarb and blanching beans in the penny place. But I'll catch up on the weekend with a chutney making marathon - grow courgettes, grow!